It’s been so crazy hot these past few months. You’d think I’d be used to it, being a former equator city dweller, but I think I’ve gotten soft here in the land of froyo and smoothies. Porchfest 2015! thanks to Pablo Raw for the photo. 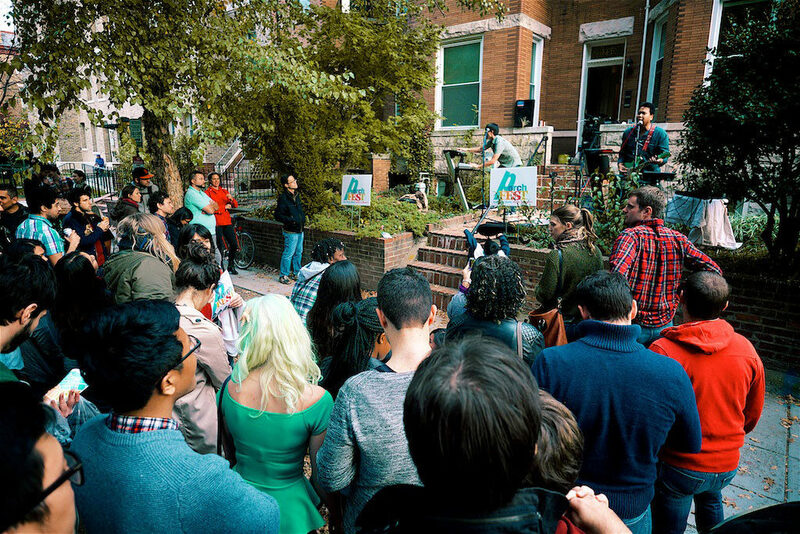 This coming Saturday, we’re rocking out at Porchfest in Adams Morgan Oct 1. More specifically, our friend Lawrence (of Saffron Holiday) is hosting a lawnlike stage in front of his house. It’s nice and elevated, so a good view, and they usually get crowded on the sidewalk, but it’s not a main thoroughfare in Adams Morgan, so not too bad watching off the street. It will probably be our last outdoor show for the year, since its going to be blitz cold this winter. After that, we will be in Fredericksburg that Friday for Fredericksburg All Ages‘ 10th Anniversary. I’ve always loved the mission of FAA, and their execution is excellent in terms of getting it out the everybody, how friendly they are, and ultimately, providing a good place to hang out without having to get blizasted all the time. Then we’re back in DC to play at Treehouse Lounge for the Halloween weekend! I’m not really a dressing up type of person, but I did wear a rat attack victim to R&R Hotel once. That got a pretty strong response. We’ll be rocking with our boy Radio Rahim, and probably backing him on a song or two, if not more. I’m hoping to have some other friends join us on the lineup to make a family affair. Anyway, that’s that. We’ll be debuting some of the new songs that we’re writing for the EP, just to see what it will sound like live and if something is just too much cowbell. We’d love to see you…..